Student-athletes at the University of Arizona strive to make an impact off the field throughout Tucson and Pima County. The second annual CATSYS Awards recognized the accomplishments of student-athletes from the past academic year, including awards for community service hours contributed by individuals and teams from April 1, 2017 to March 31, 2018. Over that period, our student-athletes were involved in a number of community service projects, totaling over 3,460 hours of service! Individual awards recognized the male and female student-athletes who contributed the most community service hours for the school year. The men's award went to Matt Salerno, a junior from Men's Swimming and Diving. Matt visited students at Gallego Primary Magnet School, created Journey Journals for children at local hospitals, and was a member of the Peer Athletic Leader (PAL) group. Gabi Stoian received recognition as the female student-athlete with the highest community service hours. As a senior on the Soccer team, Gabi lead her team to a third NCAA tournament appearance in the last four years. Off the field, she volunteered at Esperero Canyon Middle School, Alice Vail Middle School, Banner University Medical Center, and the Parkinson Wellness Recovery Center, just to name a few. The coveted Athletics Director Cup for Community Service goes to the team with the highest average amount of hours per team member. 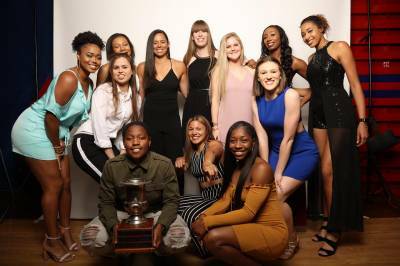 This year, Women's Basketball earned this award by averaging 43 hours of community service per member, retaining their title from last year. Some of their volunteer hours were at the Boys and Girls Club, Ronald McDonald House, Habitat for Humanity, Tucson Clean and Beautiful, American Heart Association and American Cancer Society, among other places. We are extremely proud of the exceptional things our student-athletes are accomplishing to represent the University of Arizona. 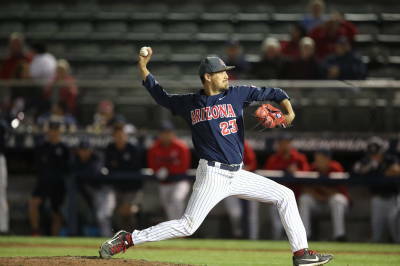 Senior right-handed pitcher Robby Medel arrived at Arizona prior to the 2015 season from TCU, and has been a staple for the baseball program ever since. The only player to have played for former coach Andy Lopez and current head coach Jay Johnson, Medel instantly embraced what it meant to be a Wildcat and has been an emotional leader for the baseball team during his time here. Few Wildcats appreciate the opportunity to wear the Cardinal and Navy more than Medel. He's appeared in 63 games over his four-year career and logged 132 1/3 innings. You had the chance to speak at the CATSYs this year. How special was that and what did you want to convey to your fellow student-athletes? It was great to have the opportunity to speak from my heart. I took that opportunity as a chance to spread my gratitude for Arizona Athletics to a room full of younger student-athletes. My hope was that it would hit home with them, and they would appreciate Arizona Athletics the way I have the last four years. It was a special opportunity, and something I won't forget. What have been some of your favorite memories from your four years in Tucson? Going to the College World Series in 2016 tops the list. Playing at the highest level of our sport and having the ability to show college baseball the true personality of Arizona Athletics was something that was very special. I think we really did that when we were on that stage. Also, seeing Hi Corbett packed every time ASU comes into town. Some of my favorite moments are also meeting our fans and season ticket holders that come out to Hi Corbett day-in and day-out and put smiles on their faces. What makes Arizona Athletics so special? What makes Arizona Athletics so special is the city of Tucson. We have a full community that supports what we do. We're not trapped in a big city, and the city of Tucson and the support of our amazing alumni, along with great support staff and coaches are what makes Arizona Athletics what it is. When you're at Hi Corbett or McKale Center or Arizona Stadium, seeing a sea of red really gives you something exterior to play for. How important is the support of the Wildcat Club? Obviously it's massive to keep Arizona Athletics a top-tier athletic program in Division I sports. The support we get from the Wildcat Club keeps Arizona Baseball in an attractive spot for top recruits because of the facilities, such as our brand new clubhouse and the Terry Francona Hitting Center. Seeing former players like Steve Kerr and Terry Francona donate to our programs shows the pride that Wildcat Club members have in the current and future student-athletes. You were a regular attendee at Arizona Football and Basketball games through your four years. How much did you enjoy supporting your fellow Wildcats, and why was that important to you? First off, I'm a huge sports fan. Coming to Arizona, I quickly bought-in to everything that is the Block A. Going to games at McKale and Arizona Stadium were my first athletic experiences here, and the support Tucson, the alumni and the students give is awesome. I couldn't have been more excited to see those same fans fill up Hi Corbett Field. In 1990, the Wildcat Club Priority Point System was created to supplement the priority seating program and to reward loyal Wildcat fans for years of season ticket purchases and contributions to Arizona Athletics. The priority point system is used to determine all post-season ticket assignments, including quantity and location. 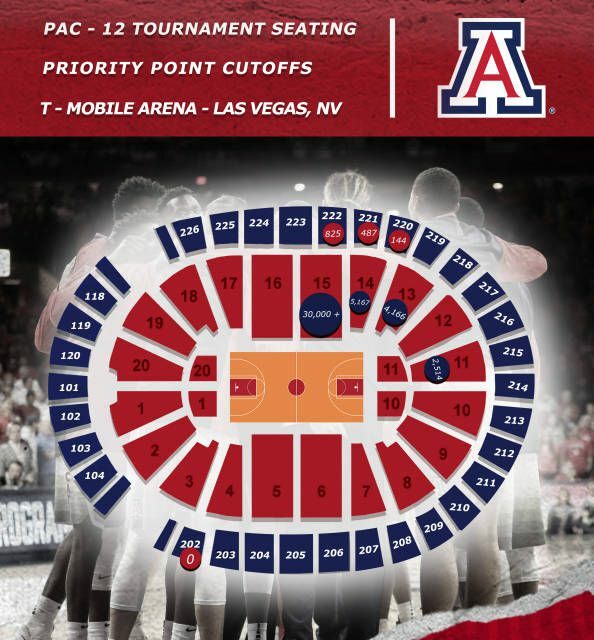 See the graphic below, which illustrates the priority point cut-offs for seating assignments to the 2017-18 Pac-12 Men's Basketball Tournament. Please keep in mind that points change each year; this map could look different next season. However, we hope it will give you a good idea of how seating was allocated. Want to know more about priority points? Head gymnastics coach John Court is in his 20th season with the program. This past year, Court was appointed interim head coach of the GymCats and, after a successful season, he was named head coach of the program going forward. Court has helped lead Arizona to 19 NCAA Regional competitions, and more recently, helped administer the 2018 Pac-12 Championships in McKale Center. However, Court also stresses the importance of academic achievements. This past season, Arizona recognized nine female athletes as Scholastic All-Americans, and two student athletes were First Team All-Conference. What are the goals of the team as the 2018-2019 season begins? Once the 2018 season was completed, I made a short list of things to get done. Work on improving the culture of our program, complete coaching staff, recruit athletes that have the qualities we stress for excellence at Arizona and transition the athletes who will be entering Arizona in July 2018. In the season, we will be a younger, less experienced team which means we have to work extremely hard in all phases of the day, practice, academics, nutrition, performance, and academics. We need to build stronger bridges and connect with the community and use every resource that is provided to us to the fullest, so our team can mature and be successful. What can fans look forward to in the upcoming season? 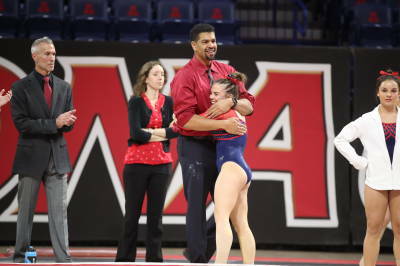 A team that has great energy and is cohesive, nationally competitive athletics, a fantastic home meet schedule and fun for all people and family that attend our meets in McKale Center. This is a great time at Arizona and the new leadership from Dr. Robbins (who watched PAC- Championships from the floor when we hosted) and Vice President and Director of Athletics, Dave Heeke, has been very impressive, the changes are for the better, and our students and coaches want to thrive here. To me, Arizona has always been about the people because we can do anything when we are together. In Tucson, the support within the community makes us all want to do well, and the fans have been a huge factor with national exposure for a lot of our programs. Every member counts. We would not be where we are without the continued support of the Wildcat Club. From facilities, locker rooms, budgetary support, and other upgrades have helped set us apart from the competition. We want to be better as we go forward and reach new heights. Why not US, why not YOU, every member will always count, and we look forward to your continued support in the future. 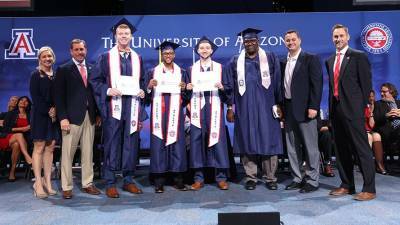 Earlier this month, 113 student-athletes received degrees from the University of Arizona. Arizona Athletics hosted a convocation ceremony to honor them with their teammates, coaches, family and friends. Want to see a photo gallery of the event?